Do you have to be a word person to see what’s wrong with Trump? 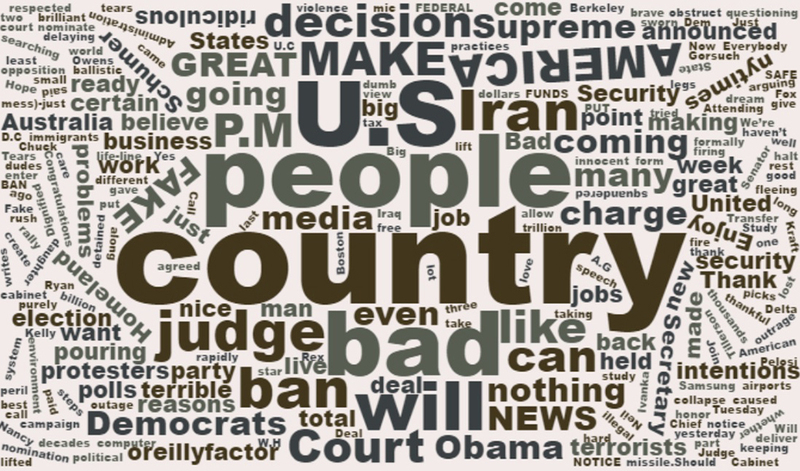 A word cloud of Trump’s Tweets from the past week. Pretending that there is something “brilliant” or “populist” about how Trump communicates is one of the worst forms of elitism because it demeans ordinary citizens who have always appreciated eloquence, as our greatest leaders knew. And please don’t compare George W. Bush to Trump on this score. We poked fun at Bush’s ability to mangle sentences, but he respected the need to find words that could move and unite the nation…. Some of my friends still have trouble getting just what is so awful about Trump. And while the correlation is far from perfect, I’ve noticed that there’s something of a tendency for such folks to be more number people than word people. How could anybody possibly consider a guy who talks like that for any sort of leadership position, much less president of the United States? It’s not just what he says, although he says some pretty awful things. It’s the way he says them. The man’s a Wharton graduate, but he communicates like someone who never made it to high school — and probably didn’t do too well in English in the lower grades, either. Being a skilled and subtle communicator is so obviously a prerequisite for the presidency that it’s tough for me to understand how anyone could even take the first step toward considering him, given the way he expresses himself. Just watch five minutes of him in those early debates, and you’d immediately put him in the “unqualified” bin, regardless of what he was talking about at the time. But I’m a word guy. Not everyone is. And those who aren’t are likely not only to dismiss what I’m saying as rank snobbishness, but to toss it out as irrelevant. And maybe my analysis is completely off. But there is some reason why there’s such a gulf — nay, an ocean — between me and people who could ever have contemplated voting for Trump. This entry was posted in 2016 Presidential, Donald Trump, Words on February 6, 2017 by Brad Warthen. I like the Orwell quotes. The point is that the process is reversible. Modern English, especially written English, is full of bad habits which spread by imitation and which can be avoided if one is willing to take the necessary trouble. If one gets rid of these habits one can think more clearly, and to think clearly is a necessary first step toward political regeneration: so that the fight against bad English is not frivolous and is not the exclusive concern of professional writers…. Do you think you’ll ever get back to writing about local events? Or will you continue with your daily Trump bashing. I’m guessing that you’ve just given up on trying to expand this blog and attract advertising. Who would ever advertise on a blog that was nothing but Trump bashing 24/7? You admit to not being a numbers guy, I’m guessing that you’re really not a business model guy either. I’ll admit that I can’t write a paragraph that would catch anyone’s attention let alone make them interested in what I had to say but I’d take that over not being able to work out a business plan or read a balance sheet and know what I’m looking at. Oh, I can read a P&L — or for that matter write one. And I can understand a business model pretty well. I can also tell when one has evaporated, as happened to newspapers in the last few years. There’s only one kind of business model I’d like to create going forward — figuring out a way to make journalism pay again, now that the old model has fallen apart. The demand is as strong as ever, but the advertising that paid for it has gone away. Not being Trump, I wouldn’t want to exaggerate my accomplishments. I’ve created ONE P&L. It was a projection to help The State decide whether to launch a new project. About 15 or so years ago, the paper was really into launching new publications for the additional revenue streams. Lake Murray Magazine was an example. I raised the question, what about an edition of the paper in Spanish? I was very active in my church’s Hispanic Ministry, and that had brought me into contact with a number of Spanish-language publications in the region. So the publisher, perhaps amused at the word guy, said to get him some data. So I dug around and inverviewed some people who had launched such pubs elsewhere, focusing particularly on instances where an established paper launched a Spanish edition. My business-side colleagues on senior staff helped me with costs — so much for newsprint, etc. I have no idea how I calculated revenues; it’s been awhile. But the deciding factor was what I learned from a guy in Texas who had launched a couple of these. He persuaded me that we lacked the Hispanic population density — more specifically, we didn’t have enough people who would prefer a paper in Spanish — to make a go of it. So I drew up my P&L projection, made a report to senior staff, gave my recommendation, and we gave up on the idea for the time being. Word guys are great at communicating ideas. Trump is very good at actually executing on his ideas. Some can describe a building in flowing prose. Trump actually builds them from the ground up. One only needs to look at the volume of words generated about Trump in the past few months to see the difference. One tweet keeps a pundit busy for hours or days. Meanwhile Trump is off doing something. No he doesn’t. Trump has other people build his hotels with borrowe money the doesn’t pay them. Hes really not much of a business man. He’s just a con artist. Funny thing is, if that’s true why do multiple companies bid for his contracts? Because they have been conned too. Really I think that is the reason. This reputation exists unfoundedly and people believe it without doing any research. His business model is say whatever works in the moment to get people to commit whether or not it’s true or whether or not you intend to deliver, and then bully, intimidate, and sue people who complain, when you don’t in fact deliver. Then they are lousy at their jobs. We’re talking about decades of available information. Yea, I’d agree. Doesn’t mean it’s not true. I think that criticism applies to a lot of voters too. Hillary voters included. Uninformed and gullible. And I believe that you actually believe that. Multi-billion dollar companies are bidding because they’re conned into bidding. These huge construction companies don’t do their research when bidding for projects they just answer calls for bids and toss out a number. God help us all. You’d think the word would be out by now that he didn’t pay. Maybe in a couple more decades all those lenders and vendors will catch on. The word is out there for people willing to hear. Most of Trump’s base does not listen to any news outlets that cover it. So what you’re saying is half the country doesn’t watch, listen to, or read the news. And you wonder why your side lost the election. Response to you, Claus, and Doug. No, Trump does pay but he uses every legal maneuver he can to reduce, cut, or prolong payments. All he has to do is get a subcontractor to sign the contract his attorney’s draw up and depending on the legalize in the contract, Trump may be able to withhold funds for an indefinite period of time. If a subcontractor or supplier doesn’t have their attorney go over a large contract with someone like Trump, ignorance is no excuse under the law. I don’t agree with contracts that are written and are almost totally to the advantage of one side but it is up to the other party to protect their interests up front, not after the fact. Also, if changes are to be made to the project and it affects the subcontractor’s contract, the subcontractor should never proceed until a legally executed change order is in place. And don’t plead the plight of a small subcontractor on one of Trump’s projects. Most of his are major, probably in the hundreds of thousands or millions. Claus, as for subcontractors bidding to someone who has a reputation for not paying, as long as there are jobs to be bid and a contractor is involved who has a reputation for withholding, finding ways to backcharge, or contest a payment, there will be subcontractors and suppliers who will quote anyway and accept a contract or purchase order knowing upfront what will most likely happen. I know of one contractor who operated like that. He would receive the monthly draw, invest the proceeds in a short term investment – 30 to 60 days and withhold payment until he received the proceeds from the investment. Sometimes it would be up to 90 – 120 days and what was so maddening about the situation is that subs and suppliers who had been burned would continue to quote and enter into contracts with him. Sometimes they would give him better pricing than they would contractors who paid on time and didn’t give them a hard time. I know this from firsthand experience. Doug, read my comment to Claus. The problem is that all too many subcontractors and suppliers will continue to do business with someone like Trump knowing they stand a strong chance of payments being delayed, reduced over a minor issue, or not paid over a faux dispute and then demand arbitration. I personally know about a contractor who used the money for short term investments and didn’t pay the full amount even when the investment was cashed in. Then the same contractor would sign a legal document stating all subcontractors and suppliers had been paid but they never were. Some very good, honest, hard working subcontractors ended up losing millions because of this particular contractor. FWIW, it was not the same one mentioned in my reply to Claus. The problem is there are all too many subcontractors and suppliers too greedy and downright stupid and they are the ones who will continue to do business with someone like Donald Trump. Bart, seriously I don’t need a lesson on bidding for contracts as either a contractor or subcontractor. I’ve done more than a few myself. Thanks, but I’m not reading your wall of text. By the way Brad, wasn’t someone “who shall not be named” banned some time ago and didn’t that someone who used the term, “wall of text” more than one time to try to go after a few who had long posts? Maybe he is back? What I’d like to know from Claus is, how come when I tried to send you an email earlier this week, I got an “Address not found” message? Fake emails on the blog are not acceptable. I pay attention and still have a good memory. Plus, writing styles, phraseology, and tone of expression are almost the same as fingerprints. I have suspected for some time “he who shall not be named” was back. There’s a cognitive divide here almost as great as the one between word people and numbers people, or even the one between those who love Neil Diamond and those who can’t stand him. Talk about being bad with words, I kinda got lost in that last sentence, didn’t I? It demonstrates a set of skills that some people admire. George W. Bush had a very thin resume. I’d take Trump’s background over W’s any day. I don’t think W’s record was awesome, but having been governor of one of largest states beat 0 experience governing any day. I think maybe it beat Obama’s experience, too. Being a junior senator isn’t as good as having executive experience, although I do like a president to have SOME experience on the federal level. I think the ideal resume for a president includes executive experience as a governor, PLUS maybe top administrative position in Washington (particularly in the national security arena, which governors tend to lack — think of G.H.W. Bush’s stint at CIA), and congressional experience. And military service. That’s just the resume, though. Beyond that you need intelligence, judgment and basically leadership talent. And dignity. I wouldn’t think I’d need to mention that, but it appears that I must. Each kind of experience has its strengths and weaknesses, and few would have all strengths. Governors lack experience leading the military and dealing with international affairs. Senators lack executive experience. People who’ve headed agencies lack a background in looking at the whole picture. So you have to look at the individual, and try to decide how well his or her strengths and weaknesses balance out. Of course, all of this is silly in the current context, because Trump not only didn’t have any of these qualities, but possesses quite a few qualities that are DISqualifying in the extreme. From a financial standpoint bankruptcy laws like tax laws aren’t a bad thing if you use them appropriately. You use each to your advantage. Very few extremely successful people have not had at least one huge financial setback where bankruptcy laws were used to help them out. I don’t know one person here who wouldn’t use their mortgage interest deduction, you aren’t required to declare it, it’s there if you wish to use it. Trump doesn’t build anything. As a “businessman,” the man is nothing but a branding tycoon. He doesn’t have to be bothered with day-to-day management of the things he slaps his brand on. His only real skill is self-promotion. Next you’ll tell me that Bill Gates doesn’t stay up all night programming and Warren Buffett doesn’t get up at 4:00 a.m. to see how the foreign markets are doing so he can get a jump on stock market when it opens. How many CEO’s actually are involved in the work their company is known for? I think you are missing Bill’s point. Trump’s business these days is licensing his name. That is the business. It’s not that he is removed from the day-to-day management of the businesses that have his name on them – he has nothing to do with them. He just gets them to pay him to let them put his name on their product. Because of the ridiculous insane reality that people think his name means something. Forbes disagrees with you. They estimate his new worth at $3.7 billion. Licensing of his name is “only” worth $14 million. Licensing and management of hotels brings in $123 million. That’s less than 3% of his net worth. Check out the properties he owns 100% with zero debt. RE: Trump’s rude comments and cutting short the phone call to PM Turnbull of Australia. Apparently some are trying to defend Trump’s behavior by pointing out that the agreement to bring the refugees to America was made months ago by Kerry and Obama and they wouldn’t release the exact language or the number of refugees to Congress’ two requests to do so. Apparently when Trump and McConnell found out the number of refugees Kerry and Obama had agreed to take upset Trump and he and Turnbull discussed it during the phone call. Fair enough to be upset when the actual facts about the agreement come out. I am sure many presidents have been upset at something their predecessor agreed to. How a leader handles “bad news” according to his or her definition of “bad news” is another thing. A good leader would have had a civil discussion with the other party, either honored the agreement or asked the other leader if he or she would be willing to discuss it further and come to a reasonable solution satisfactory to both sides. Then they would have agreed to meet or have their representatives meet to work out the existing or changed details. But no, Trump had to be Trump and cut the call short, be rude and disrespectful, and then boast that it was the worst call of the day with leaders of other countries. This is the man I hear many of his supporters say with conviction, “he is a business man and we need a business man in the White House”, or “he tells it like it is”, or “he knows how to choose the best person possible for a job”, and other such nonsense. To top it off, he makes a comment about “Celebrity Apprentice” and Arnold’s low ratings. I liked Arnold’s reply but damn, when is a reality show’s ratings worth a Tweet from the POTUS? If one wants the perfect example of a business man who is also capable of being the leader of this country, look no further than Jon Huntsman. He will never have the opportunity because the radical right and left won’t vote for him and the center left and center right have never had the opportunity to really get to know who he is. He is a better man by a factor of 1 million than Trump will ever be. Not flashy or bombastic, more in the fashion of GWB in demeanor when dealing with foreign leaders. I would use Obama but at times, he had his moments when he treated other leaders with little or no respect. Huntsman is just one example of individuals on both sides who are capable leaders and don’t have so much excess baggage they need a fleet of cargo planes to carry them from place to place. So, we have an orange haired, pouty faced man-child, a true narcissist, and totally unqualified man occupying the White House. Wonder if his family will walk back their comment that moving into the White House is a step down from what Trump is used to? Let me be clear. There’s plenty wrong with this guy beyond the words. But his lack of facility with the language should have disqualified him, before even getting to the stuff he wanted to do. It was painfully obvious from the start that he simply lacked a basic prerequisite. If I were the manager hiring for the job of president, I’d know in the initial phone interview that this guy lacked the skills. I wouldn’t get his hopes up by asking him to come in for a face-to-face. And golf courses, and TV shows, and any number of things you and I could never do. His greatest skill appears to be hiring the right people to get things done. What exactly were Obama’s qualifications before becoming President? Aside from being, you know, really good with the words, they were fairly minimal. Of course, you could say the same about JFK, and even Abe Lincoln. Great with words, relatively light (compared to LBJ, and Seward) on experience. Obama was a community organizer in Chicago. And we all know how organized those Chicago communities are today. Which is always a good skill to have. That’s why I lost the only serious editorial call I ever lost, back in 2000. I saw McCain as personally better qualified than Bush. But that’s in part because I was a very hands-on guy. I didn’t like to ask subordinates to do things I couldn’t do myself. My publisher was the CEO type who wasn’t concerned that he personally wasn’t a journalist. He said it was about hiring the right people, listening to them, and making the right decisions. And yet he hired Sean Spicer and Kelly Anne Conway to help him with his words. In my opinion, they are not getting it done. I dunno Scout, Conway did remind us of the Bowling Green massacre. And then not paying. If his daddy hadn’t bailed him out multiple times and had his daddy’s contacts not been at his disposal Donald Trump would be working at a car wash somewhere. He really doesn’t have much business talent. How else do you explain a $900 million lose on one tax return. In effect the taxpayers subsidized his phony business acumen. Besides Brad is spot on with his analysis that being a good businessman does not make a good POTUS. His 2 biggest decisions so far have failed spectacularly. First his Muslim ban reeked havoc on 10s of thousands of innocent people for no comprehensible reason. And it’s losing badly in the courts. (A good reason to fight to delay the SCOTUS nominee). Second his go ahead call for the raid in Yemen raid was a tragic blunder. It failed to achieve its primary goal of taking out a high ranking Al Queda operative who is now openly mocking the gropper in chief. And an American soldier and dozens of innocent civilians died. And for good measure we lost a V-22. His so called ‘business skills’ have not served him well so far. We lost a stealth Blackhawk under Obama. Fact is between Navy, Air Force and Marines we lose an aircraft on the average of one every 3-4 weeks. That’s a joke, right, Doug? In light of this Cabinet? Betsy DeVos? Pruitt at EPA? The Sec’y of Labor guy? Spicer as press sec’y and Kellyanne Conway? People who make Trump appear in a worse light than he manages to do himself? If he doesn’t find some people willing to tell him the truth to his face, or if he is unwilling to face the truths those advisors might tell him, he’s not going to last a year in the job. I think he listened to somebody on Gorsuch. That’s promising. He’s somebody one of the Bushes, or Reagan or Ford or Nixon, would have nominated. Way normal. The disagreement between Bannon and Kelly pitted a political operator against a military disciplinarian. Two administration officials gave the following account of their exchange: Respectfully but firmly, the retired general told Bannon that despite his high position in the White House and close relationship with President Trump, the former Breitbart chief was not in Kelly’s chain of command. If the president wanted Kelly to back off from issuing the waiver, Kelly would have to hear it from the president directly, he told Bannon. White House press secretary Sean Spicer said Kelly and Bannon spoke on Jan. 27 and 29, but denied they had a confrontation over the green card waiver. In an email sent late Saturday, Bannon also denied a confrontation with Kelly and said he had not told him to withhold the waiver…. You (and others) are biased. I’ve been amazed at the total knee jerk reaction that occurs by some people every time ANYTHING is said by or about someone in the Trump administration. It is well beyond derangement. Meanwhile, the world is carrying on despite the ravings. There’s a bill just introduced to abolish the Dept. of Education. Which I’m fine with, it was a department introduced by Jimmy Carter in 1979 and totally unnecessary. Let states hand education. I’d bet the vast majority of people here got through school without this department in place. Plus it’d eliminate approximately $75 billion in wasteful spending. I’m with you on eliminating the federal department of education. I always have been, as I’ve said many times. At the very least, recreate the old HEW. By the way, would you mind itemizing the “$75 billion in wasteful spending,” so that we know what you regard as “wasteful”? What’s to itemize, you get rid of the department, you get rid of the $75 billion in spending. You just agreed that the department needs to be abolished, now you want to justify some of it’s spending. How about you tell us what you want the federal government to be spending money on in regards to education. I think Scout can answer that better than I can. Miss Jean Louise? Well I’m kind of partial to special education. Maybe it doesn’t need to be part of a department of ed, maybe it can be separate. I’m not against change, if the needs are looked at and still managed for. I have no doubt better management is possible. The sped law was first passed in 76, so it apparently existed before the dept of ed anyway. I think title I funding is also pretty important, or at least the need it fills, if you wanted to look at the needs and do it differently. My issue with Devos is not against change. My issue with Trump is not against change. It’s against the specific things they say and do that don’t make sense. I’m not against school choice for its own sake. But the school choice plans she has backed specifically have major issues and don’t address the problems she claims they do. This feels a little disorganized. Sorry I’m tired. Hope it made sense. Which is the way you see it, which frankly is amazing. What’s happened? A phone call with Australia that didn’t have the usual platitudes and phoniness? A delay on allowing immigrants from certain nations from entering the U.S. which will ultimately be resolved by the courts? Sorry, but I haven’t seen anything yet that has been as bad as the Obamacare rollout or Benghazi. My wife has commented several times about how limited Trump’s vocabulary seems to be. The same words and phrases are repeated and recycled. Obama was often overly-nuanced and didn’t sell his ideas very hard. Trump plays the “repeat it often enough and it becomes believable” trick. As long as he stays in office, we’re in for simplistic sound bytes and lies on top of lies. I can live with the simplistic language and even the lies to an extent but the horrible decisions are what most concern me. Next time we’ll vote in a thespian who enjoys reading the dictionary as President and you’ll both be happier. But yeah, I’d take him any day over what we’ve got. I’d take him over Hillary Clinton, too. I’d take Reagan over anyone who has served as President. Scub those four faces off Rushmore and replace it with one of The Gipper. Then I just don’t see how you could support Trump. There’s just no similarity. Trump’s approval rating according to two mainstream polls is above 50%. Time for you to punch the turbo button on your hysteria machine. The current setting of “obsessive compulsive derangement” isn’t working. Rasmussen is not mainstream; it is a Republican leaning organization . Not sure about Reuter. Is that a % of Republicans or all electorate? Like I’ve said before, Doug, what’s got me more depressed for the future of the democracy is not Trump himself as much as the fact that there is such a large portion of the population that would be totally OK with a more authoritarian-leaning state. So I do believe the polls you cite. Somewhere else on this thread you said I was biased, and you’re right—I’m biased against authoritarians who are just plain nasty individuals with borderline psychopathic narcissistic tendencies. That might work well in building a fortune in business, but not running the world’s largest democracy. At the risk of sounding like a broken record, it’s not the policies—I’ve been concerned before at the advent of the Reagan and 2 Bush presidencies, but nothing like this—it’s the man. I even don’t disagree with everything Trump says–but it doesn’t matter—it’s the man, not the policies. Let’s just see how it plays out. You think I’m biased, or hysterical, ok fine maybe so. I happen to think you’re whistling in the dark. We’ll see what happens. For our sake I hope you are right and I am wrong. That would be nice. Of course, it’s impossible, as Trump demonstrates every day. And what do you mean, “borderline?” If he’s a borderline narcissist, what does an all-the-way, whole-hog narcissist look like? And yes, the greater problem is not Trump himself. As long as he stayed the national joke he was in the past, when people had good sense, that was fine — as long as we didn’t have to hear about him and his weirdness. So Trump is the symptom, not the sickness. The sickness is the way government has performed over the past few decades, going back to Reagan. And that sickness is driven by one thing: greed – whether in the form of greedy capitalists who rig the system or people who expect others to provide for them or the causes they believe are important. It all comes down to taking money from group X and giving it to group Y. So rant all you’d like about Trump. But he’s just a byproduct of people like Pelosi, Boehner, Reid, and Ryan. Congress created the environment that allowed Trump to rise to the top. Democrats and Republicans are to equally to blame for the mess we’re in. But voters will keep putting the same people in office and expect different results. Lindsey Graham and Chuck Schumer aren’t the solution. They’re the problem. Seriously, Doug, how could anyone look at anything that’s wrong with our political system and think Donald J. Trump is the answer? And of course, that’s THE question. I’ve asked it many, many times over the last year or so. What has happened to a person’s cognitive processes that would cause him or her to look at our actual problems — the dysfunction caused by insane hyperpartisanship informed by impractical ideologies — and think Trump would make things BETTER instead of worse? It’s like adding 2 and 2 and getting minus 147.3. It absolutely doesn’t follow. Unless one believes as you do — which is that government will automatically be better if it’s run by an “outsider” — no matter how delusional, ignorant, dishonest, socially dysfunctional or narcissistic that “outsider” is. A couple of nights ago, I was reminded of something that has occurred to me a number of times in the past as something that might, in some part, explain the disconnect between me and Trump voters. For whatever reason, after I switched from the Roku back to TV, I didn’t turn it off immediately, and in the seconds before I did, I saw that what was on this broadcast network was “Celebrity Apprentice.” So I watched it for a minute or two, because of the show’s connection to our new president. I am not saying he is the solution. He is different. He is a response to Congress and eight years of Obama doing very little. Like it or not, Trump gives the perception of doing things. Half the country is fine with that. And I repeat what I’ve said before, nothing he has done has been as bad as the Obamacare rollout. Yep, he’s different. And as I said, the Tasmanian Devil and Yosemite Sam would be different. PeeWee Herman would be different. Tiny Tim (the novelty singer, not the Dickens character) would be different. But to vote for any of them for president and expect that to be an IMPROVEMENT is simply insane. He is obviously — painfully obviously — the most unfit individual we’ve ever seen even get close to the presidency. That includes Andrew Jackson, and William Jennings Bryan, and even George B. McClellan. Yep, she was all we had. So bottom line, it really didn’t matter that we had problems with her. She was the only alternative to Donald Trump, period. Doug just equated the roll-out of Obamacare with the hour one implementation of Trump’s xenophobic pandering – which resulted in real, actual damage to both out nation, its reputation and hundreds of thousands of innocent people already vigorously vetted by America for entry. It’s not just the poor language skills that scream incompetence to me. It’s also the emotional immaturity that the simplistic words broadcast so well. I spend a good part of my day talking to 3-6 year olds. It’s quite common in a conversation with a 4 year old that if you mention something unique that you happen to own, they may respond that they have one too at their house and it is better. It could be something that you personally made that is one of a kind, and yet they will insist they have one just like it. It’s cute when a 4 year old is so convinced of something that can’t possibly be true. It’s easy to forgive a four year old. They are supposed to be emotionally immature and egocentric. It’s not cute when a grown man does it. And it’s really shocking when other adults don’t see through it. And that’s the other thing that makes me marvel at Trump voters. I know some of them are parents, but I don’t see how that can be. We expect the way he behaves in a 4-year-old, as you say. But even then, as parents, we correct that behavior. And by the time they’re 7 or 8, we don’t tolerate it anymore. In fact, if I couldn’t get a child to start changing that behavior by middle school, I’d start to worry that he or she might be seriously emotionally disturbed. Do other people not raise their kids that way? And if they do, why do they tolerate such behavior in this grown man? The alternative was voting for a pathological liar and hypocrite. A retread from 1996. A supporter of a husband who was a serial abuser of women including a young employee. A lot of people voted for something different. Would you tell your daughters to emulate Hillary? Well, I’d prefer that they not pursue power on that scale. I’d rather they lead lives as normal as possible. So then, is the problem that Hillary was ambitious? If it were so, it was a grievous fault, And grievously hath Hillary answered it. Yes. And I have. Hillary is a great role model. Let me know how they respond to their husband’s infidelities and sexual harassment one day. Stand by your man, right? I don’t ever find it troubling that people try to make their marriage work – short of abuse, that is. I’m happy to knock Hillary for what she herself has done, but I’m not going to hold her desire to make her marriage work against her. In the same way, we can knock Bill all day long for his slimy self. Yeah. I don’t think I’ve ever thought, much less spoken, ill of anyone for NOT getting a divorce. Voting for the Tasmanian Devil from the cartoons would have been different, too. Or Yosemite Sam. But would that have been a responsible use of anyone’s vote? I was never much of a Hillary fan, but wow… it’s stunning the lengths people went to, the logical backflips they performed, to demonize and reject that woman. For instance, I can’t believe anyone can talk about HER being a liar in the context of a conversation about DONALD TRUMP! I mean, really — do you not GET how absurd that is? Or is it that you excuse him because he’s so deluded that he doesn’t KNOW that practically nothing he says is true? Do you blame her more for her comparatively modest failings because you know she’s obviously a grownup who should know better? Here’s a question, why didn’t Hillary divorce him after he was caught in an affair for the 2nd, 3rd, 4th… times he was caught? This doesn’t count the times he wasn’t caught. She put up with him because she knew a divorce would be an end to her political career. Without Bill she was a nobody. She doesn’t care about anyone but herself. Read what those who had to work with/for her have to say about how she treated them. So Catholics are okay with infidelity? You learn some thing new everyday. Aren’t the Clinton’s Baptist? That would explain her drinking to excess in private. I think Bill may have been brought up Baptist. Hillary’s very much a Methodist. She blamed the women in all cases. Not terribly surprising. Not wonderful, not admirable. But not surprising. Not really true but still a much better choice. Before we leave the subject of Hillary Clinton, let me restate the choice we had in 2016. On the one hand, you had a flawed person (although not NEARLY as flawed as the Hillary Haters would have it) who nevertheless fit within the broad set of people from our history who have had the qualifications to be considered for president of the United States. She fit EASILY into that category, having less experience than some, but a good bit more than others who made good presidents. On the other hand you had a seriously unbalanced, reality-challenged, childish narcissist who offered no qualifications for (or even basic understanding of) the job, and was obviously grossly unfit for such a sensitive, powerful position. There never really was a choice for people who cared about the country and respected the office. The two parties offered us a person we weren’t crazy about and a person we absolutely could not consider for a moment. And no viable independent or third-party candidates emerged. And people realized a vote for Hillary would be more of the same. So some times you have to switch things up to see if things get better. A Hillary administration would just have been Obama 2.0. or worse. An Obama 2.0, or a Bush 2.0, or a Clinton 2.0, or a Reagan 2.0, or what have you, would obviously be much, much, MUCH preferable to putting the most unfit, unqualified, unbalanced individual ever to capture a major-party nomination in charge of our government. This “We had to destroy the country to save it” bit we tend to hear from Trump supporters when they run out of other arguments really, truly, is unpersuasive. How many days will it take of the United States not falling apart before you will realize you’re wrong? Nothing that has happened so far is big news. He nominated people for cabinet posts and they were confirmed by Republicans. Democrats don’t like their politics. Well, that’s too bad, isn’t it? Maybe next time don’t allow Hillary to rig the process. Sanders would have beaten Trump. He would have won every state Hillary won plus a couple more. Don’t ever forget that. Brad will never admit to being wrong. Because he strongly and seriously believes he’s right. I need to call my broker and tell him to invest heavily in any company that produces depression medications and alcohol companies. You should have done that on Nov. 8. The likelihood of an increase in demand across the country was pretty obvious by that point. Where have you BEEN? Did we have a day when the country was not falling apart since he was inaugurated? Did I sleep through it? This constant chaotic madness is what a country falling apart LOOKS LIKE. Did you miss that yesterday, the PRESIDENT OF THE UNITED STATES told senior military commanders that there have been terror attacks against this country that the news media are covering up? And this insane assertion was offered to justify a state of national emergency that necessitated banning Muslims (except those from countries where he has hotels) from our borders? This happened! In the real world! If someone tried to put that in a movie, they’d take it out because audiences wouldn’t believe it. It’s too far-fetched. How bad does it need to get for you, Doug? What’s the line for you? Must there be mushroom clouds? I’m not prepared to wait for that to sound the alarm. That would be a tad late. “Realize you’re wrong?” REALLY? If Trump were getting up every morning saying, “I’ve got to do everything in my power to prove Brad was right today,” he couldn’t be doing a better job. Seriously. He’s really impressing me on this score. I don’t know, have we had a day where liberals weren’t rioting? I believe the term is domestic terrorism, you won’t see much of it on NBC Nightly News. At least the cops who have to work overtime protecting them are making money. You admit to not being a money guy, and now you’re giving me financial advice? Yep, and I’m not even charging you. Is that a Michelle Obama quote? Don’t like it, there’s the door. My life hasn’t changed one bit in the last month, nor do I expect to see major changes in the upcoming year. I’d hate to wake up every morning dreading the rest of the day like some of you here. Just look in Michelle’s college thesis… oh, wait. Nevermind. At least Melania has a voice that a guy can listen to and not be reminded of a person playing up to the audience on Ellen. It’s almost as bad as trying to listen to Hillary try to talk tough. occupydemocrats.com… there’s an unbiased websited. My point is that the degree doesn’t drive the success people have every time. True. And personally, I don’t attach a lot of importance to degrees. Perhaps because I only have a bachelor’s. But it does surprise me when someone who has a degree, and from a prestigious institution, doesn’t express himself well. That was one of the surprising things about George W. Bush, graduate of Yale and Harvard. Wharton is a part of Penn, but I don’t know if he technically graduated from Wharton. It’s not specific.